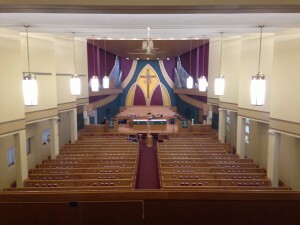 Church refurbishment – new carpet, paint, wood paneling & wood trim. 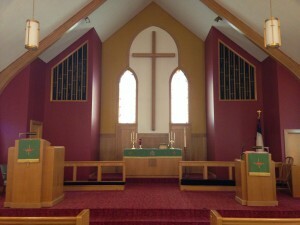 Completed Project | Christ Lutheran Church, Pickrell, NE, Sanctuary, Narthex & Fellowship Hall refurbishment. Update and refresh interiors with new flooring. Church adds dramatic pattern carpeting to center aisle with coordinating carpets in solids & small patterns for front and perimeter.